Last month in Egypt, I faced one of my deepest fears. Since early childhood I was afraid of darkness, and claustrophobic in narrow rooms and in big crowds of people. That kept me from experiencing a lot of exciting things during my whole life. Entering the first pyramid, I turned around after 3 meters. I had to bent over, which was very uncomfortable. I couldn’t see how long I had to duck down in this corridor until I could stand up again in a larger room. The panic attack was around the corner. Only with the support of a guy of our group, who proposed to enter backwards, I eventually got in there. Still feeling very nervous, trying to breathe deeply and to convince myself that everything would be ok. 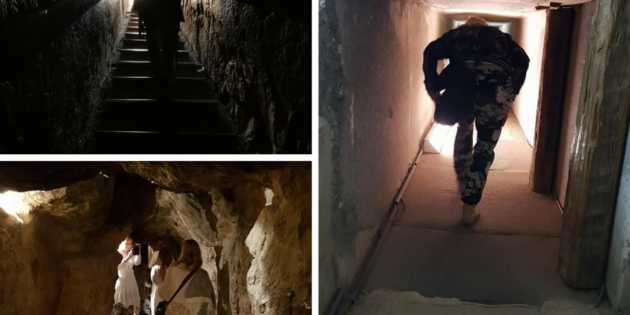 In the evening, our tour-leader told us about narrow, low ceilinged corridors in the pyramid we were about to visit on the next day and that, when she was there last time, the guards turned off the light. I was already freaking out while listening. But then I heard my inner voice whispering: Use the tool you’ve been trained in. And that’s what I did. Before I went to sleep, I lead myself through the process, reprogramming my belief around darkness and claustrophobia and it worked! From there on, I had no problem to access any of the pyramids or dark places! into theta brain waves. That’s the state your brain enters when you sleep, so that you can completely relax and release. I came back into my body. Do you have fears or something that holds you back to show up at your best and hinder you from being successful? You can have a session with me, where you bring me the One thing that is in your way that you can’t clear, where you keep going into self sabotage. When we are sabotaging ourselves, we are no longer loving ourselves. You wouldn’t do to other people some of the things you are doing to yourself. Get on a call with me, we can identify the one thing that you are using to sabotage yourself, clear it and I coach you to what to do next. „I had a healing session with Klana about my patterns, my fears and even past traumas and it was amazing! She listened carefully to what I had to say without any judgement, she put full attention one me, and i felt that someone really care and interested to know my story. This was very powerful, because she was listening with intention to understand, and not to give me an answer or an advise. After Klana gave me very meaningful feed back, and found a spot that I was not aware of even existed. She showed me what I had to focus on in order to change my destructive believe that didn’t allow me to be fully happy. Her approach is very empathetic, very kind, very accepting and very genuine. talking to her i had a feeling i was talking to my self, or someone who knows me well and knows what i want and need. I am excited to help you clear what’s in your way to success. Click here.